In the Year of Great Teaching post I shared my schema for great teaching. 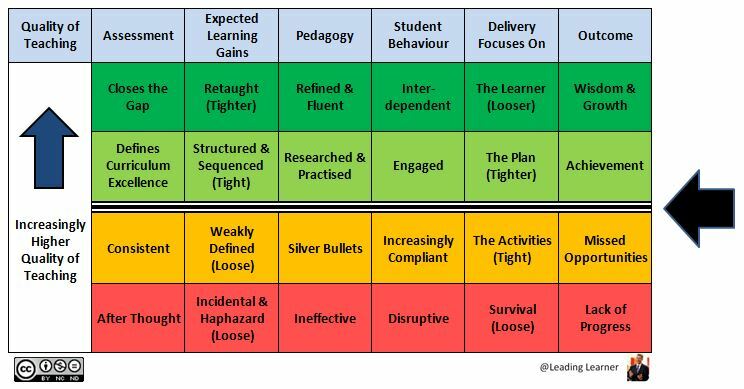 In this post I want to look at the threshold for good and then great teaching, learning and student outcomes and how we might cross the pedagogy and behaviour thresholds. Are you ready to abandon ineffective practice and the search for silver bullets? The answer to this might seem pretty obvious but teachers and school leaders too often chase the “next great thing” with little evidence it actually works. We already have plenty of evidence of which teaching and learning strategies are most likely to be effective. I sometimes find myself talking about “proven strategies” when it would be more correct to have said, “Strategies that are more likely to be effective.” These strategies need to be researched by teachers, initially, to know what they are and then to develop a deeper understanding of how they work and could be applied. An example of this can be found in Kagan Structures (Co-operative Learning) where the underlying principles of: Positive Interdependence, Individual Accountability, Equal Participation and Simultaneous Interaction are the key to understanding their potential impact. These principles can be applied to a whole series of activities including the effective use of mini whiteboards and the best use of the “pause” in Pose, Pause, Pounce & Bounce questioning technique. The pause provides thinking time but can also allow positive interdependence, equal participation and simultaneous interaction if used properly. We need to understand teaching at a deep conceptual level if we want to become a great teacher. The Education Endowment Toolkit and the work of John Hattie are both great starting points, to help make decisions about potential teaching approaches. 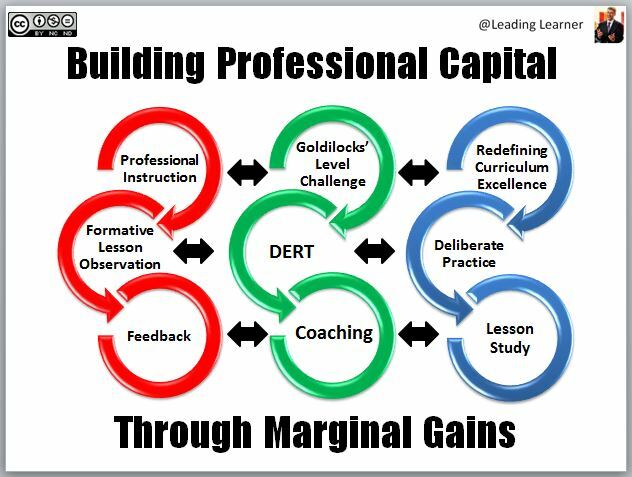 Once effective practice has been identified it needs to be practised and honed over time. However, our knowledge of effective pedagogy mustn’t be static nor simply gleaned from researchers. Our research should continue in our own class room. Great teachers will critique their own practice and look at ways to refine and enhance what they do. Over time they develop an automaticity in the use of these more effective practices, which they contextualise and adapt within their school. They routinise their teaching and learning strategies to create familiarity and minimise the effort required, by themselves and students, in the class room. This leads to a fluency, an appearance of effortless pedagogy, as people become more expert. The use of approaches like lesson study may help with this refinement of practice. An example can be found in the post, Lesson Study: 3 Heads Are Better than 1. Which of your current class room practices are informed or enhanced by research? How certain is the research about the effectiveness of these particular practices or strategies? What are the core principles or concepts? Do you discuss & agree with colleagues how to teach key concepts/difficult content and skills? Do you discuss & agree with colleagues how to approach the teaching of common misconceptions? 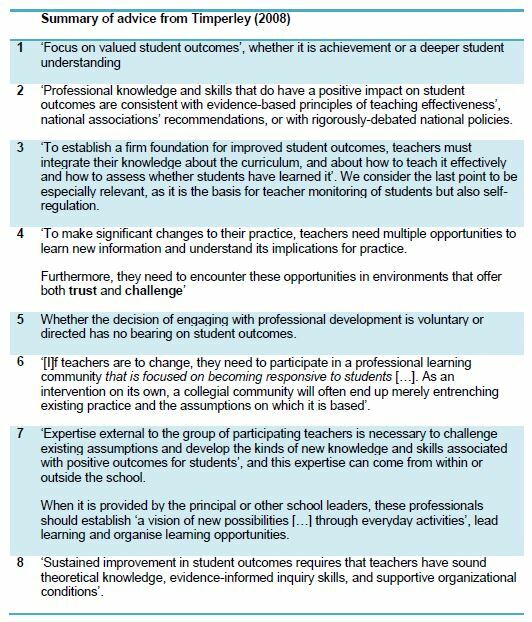 Which areas of your classroom practice are you seeking to improve over the next six to twelve months? More than one or two areas are likely to be overwhelming, keep it real. How are you honing and refining your current practices? Who is helping you? Is your peer coach/mentor/developer effectively challenging your status quo and assertions about what works? Is s/he keeping the focus on students’ learning? Are you using feedback from students – outcomes of assessments and student voice – to improve schemes of learning/your teaching? (“Know thy Impact” – John Hattie). How are you responding to the feedback given? Once a teacher has achieved compliant behaviour there is a need to explicitly develop specific learning behaviours. We have used the 5Rs as a way of describing and emphasising these learning behaviours. A learner needs to be: responsible, resilient, resourceful, reasoning and reflective. None of these can be built in isolation from the factual, conceptual or procedural knowledge within a subject. Achieving compliance from a class may well be a considered a success by many teachers but it is only the starting point a launch pad on the way to great teaching. Without compliance things can pretty soon descend into disruption and at worse chaos. The responsible learner is embedded in our Behaviour Policy. One of the key learning behaviour a student needs to develop is the ability to be engaged, that is, to spend time on task “thinking hard about what they are supposed to be learning”. The development of this resilient learner needs to be honed within a conceptually demanding curriculum. You can’t become resilient if the learning is just too easy. Students also need to learn and practice the behaviours required to become unstuck when the work is demanding and appears beyond them. They may need to show greater reasoning or resourcefulness. They need to approach challenging work, which they have not yet mastered, by thinking like a scientist, mathematician, geographer, linguist or musician as appropriate. These behaviours have to be explicitly taught to students and then practiced by them. Reflecting on their approaches is part of this process of embedding. What do these behaviours look like in your subject? Students should increasingly become part of wider learning communities. They should be interdependent and able to use the teacher, fellow students, written sources, hard copy & digital, social media and both face to face and on-line experts to advance their learning. Have you established, within your class room, the basic rules, routines, rewards and sanctions which are required to control students’ behaviour and ensure compliance? Are you consistent, persistent and ruthless in the application of basic rules, routines, rewards and sanctions lesson after lesson? What are the learning behaviours that you intend to explicitly teach in your next unit of learning? During the next term? In the next year? Do you provide opportunities for students to practice and hone learning behaviours? Engagement and Resilience in a cognitively challenging curriculum? Reasoning and Resourcefulness by insisting students struggle and seek to get themselves unstuck? Once you have established a student’s ability to work independently, how are you developing students’ interdependence – their ability to use multiple sources to assist their learning and be a source of learning for others? My job is increasingly about tomorrow, next week, next month and next year. 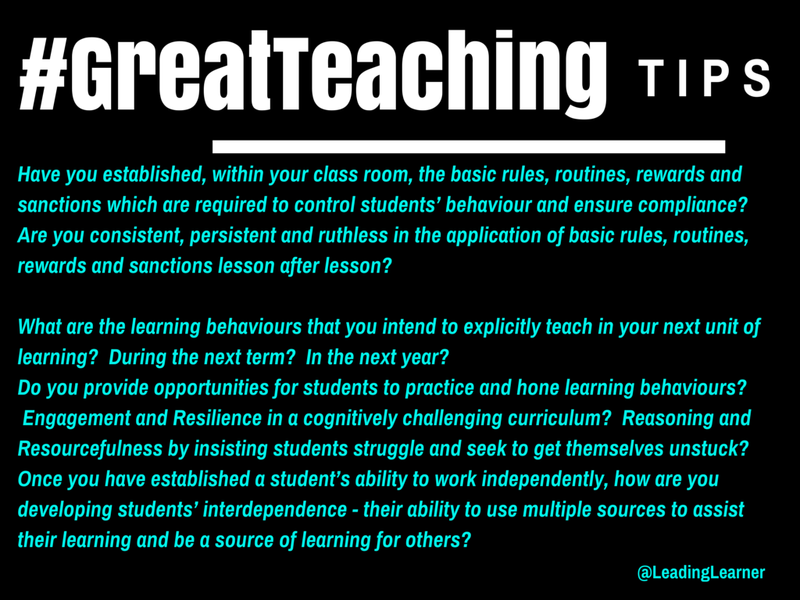 The #GreatTeaching blogs are about things that we are seeking to develop in our academies within the Multi Academy Trust. It is multi-faceted, long term but most of all hugely exciting journey. In many ways it is simply common sense, good practice and a focus on our core purpose. #DIYTeachingCPD – the page consists of a series of links to posts on improving the quality of teaching and learning with a number of free downloadable resources. #DIYTeaching Resources – the page consists of a series of free downloadable resources on improving the quality of teaching and learning plus some planners which can be used to plan the learning and lessons. « British Values: Are We Already In a Mess? I love your bolposts and enjoy reading them more than any others on the web. They are always stacked full of useful stuff (used sparingly) and for that I thank you. I would love to hear what you think about my belief, which sort of cuts across the utopian view of teachers. The country needs approximately 450,000 teachers, and one issue in my view is that not all teachers are going to be outstanding, it just isnt going to happen. Arent we better to admit this and develop a system that has outstanding teachers, excellent teachers, good teachers and OK teachers. Spending scarce resources on trying to make all teachers excellent is for me very inefficient. I think the US had a good idea with their “Direct Instruction” model. I dont like it awfully but I feel is is actually quite efficient. People good at developing the resources do so and instructional desingers (may also be resource experts) design the process and then the thing is deleivered by people who are good at delivering. Perhaps the boundary between TA/HLTA/Teacher could be blurred and start to carry out this function. Noone should underestimate the effort and resources required to create an outstanding teacher out 400,000 of those out there currently doing the job, let alone maintain that level of performance. It ain’t going to happen. The thing is doomed to fail amongst great stress and inefficiency. Some will say that I should have more faith in teachers. Some should say I should develop a growth midset. I would ask those people to see whether they are able to think of people they have worked with who do a good job, are happy to do a good job and teach very effectively. There are yet others that I have seen who I look at and think, this teacher will never be outstanding but is consistently good following a great deal of effort on their part. I think thye whole thing needs rethinking and creativity. Less thinking about how to change what we have and more thinking about changing the whole kit and caboodle. Just as not all lawyers are outstanding, not all doctors are outstanding, not all plumbers are outstanding, not all bus drivers are outstanding, not all builders are outstanding, not all admin assistants are outstanding, not all vetsw are outstanding, not all architects are outstanding, not all racing drivers are outstanding, not all ltennis players are outstanding, not all fishermen are outstanding, not all traffic wardens are outstanding, not all nurses are outstanding, not all soldiers are outstanding, not all lmanagers are outstanding………. not all teachers are outstanding, it’s the way of the world. Thanks for taking the time to add this comment. I think the comments are overtaking the post in quality. Great to see that people are willing to move beyond shallow initiatives. Thanks again for the comment and your kind words. There is an element of reality in seeing all professions as a mixed ability group. My feelings are that there is so much more we could do around enhancing teacher effectiveness. From greater controls over who can be a teacher, much better ITE and induction/early years PD, ongoing PD and focus on what impacts on student achievement (use of direct instruction is an example) and so on … feel another blog post coming on. For too longer we’ve focussed on structural changes in education, with limited evidence or impact, rather than focussing on teacher effectiveness and school effectiveness where the difference for young people is made.